← CTANZ Symposium – registrations are open! Many of this blog’s posts are for local events and exhibitions that not all of us can get to, but one of the beauties of the University of Otago’s Special Collections is that they develop online versions of all their exhibitions. 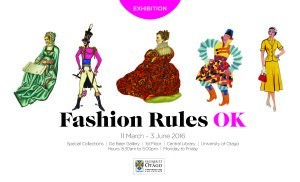 As previously noted, their latest exhibition, Fashion Rules OK, curated by Elaine Webster with support and contributions from many quarters, draws together books, magazines and objects to sample the breadth and diversity of writing on fashion, from history to couture to films and footwear. It is, of course, entirely fabulous, literally gorgeous and shiny, as well as being witty and perceptive. So if you can’t personally come to Dunedin before June to see what Elaine and the team put together, the exhibition can come to your electronic device here. As one of many who made small contributions to the exhibition, I’m biased but thoroughly recommend it. As an aside, one of the exhibition’s anchors is Racinet’s massive costume history. In case you haven’t stumbled on it, Taschen have recently republished a version of this, with all the plates and judiciously selected text. It’s shiny and colourful and small and ridiculously affordable for 500 full colour plates – go down to your local indie bookshop and invest in this essential costume reference. This entry was posted in Books, Collections, CTANZ people, Dunedin, Exhibitions, Fashion, Reading, Research resources and tagged Special Collections Racinet books exhibitions. Bookmark the permalink.